I am undertaking my PhD in the Farrar laboratory, which is part of the School of Genetics and Microbiology at Trinity College Dublin. Currently I am investigating novel therapeutics for the alleviation of mitochondrial dysfunction, both at the primary level by trying to correct the underlying genetic problem, and at the secondary level of modulating the effects of mitochondrial dysfunction. Figure 1: Two representative traces from spectrophotometric analysis. A340nm. The black line represents untreated cells. The blue line represents cells treated with potential therapeutic A and the red line represents therapeutic B. The rate of change (slope) of the absorbance shows the rate of NADH oxidation. The addition of ubiquinone (first dashed line) starts the reaction. The addition of Rotenone (second dashed line) inhibits complex I activity and allows the therapeutic activity to be evaluated. Finally the addition of Flavone (third dashed line) allows the levels of background activity to be assessed. 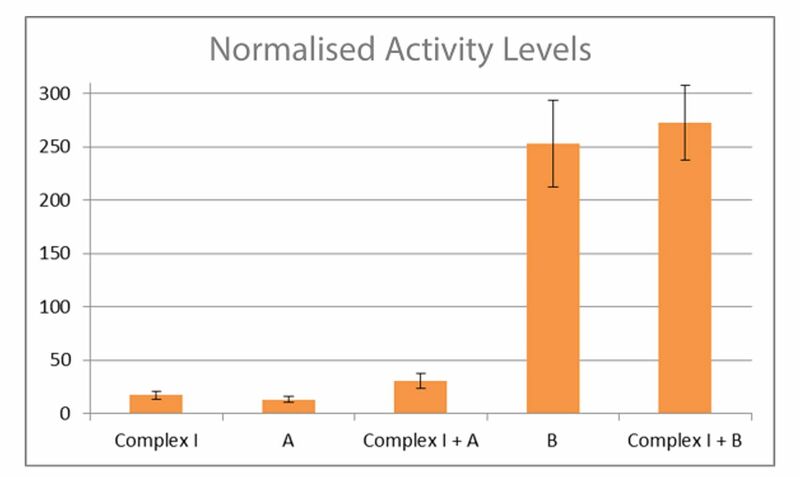 Please note that therapeutic B required a 10x dilution in order to exhibit a linear reaction, as seen above (see figure 2 for normalised activity levels). 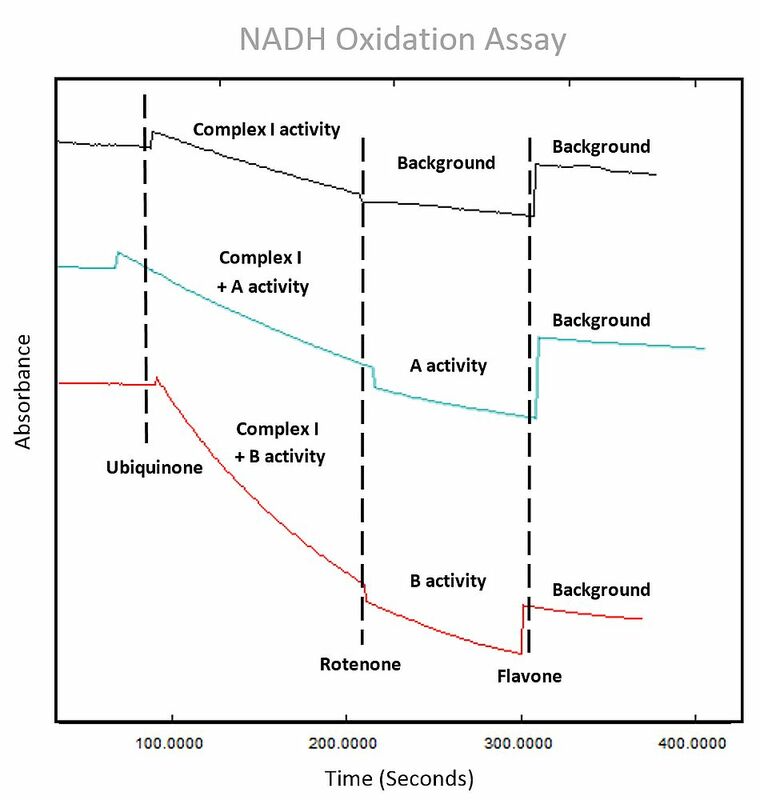 Figure 2: Normalised Activity Levels of NADH Oxidation. 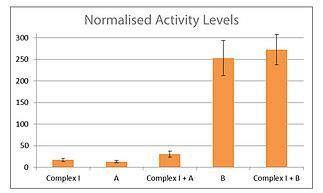 Complex I activity (17.28), A activity (13.09), Complex I + A activity (30.72), B activity (252.97) and Complex I + B activity (272.47) measured in nmol min-1 mg-1. Statistical significance was found between both Complex I + B and B when compared to wild type Complex I activity, with p values of 1.14x10-7 and 7.57x10-7 respectively. Mitochondrial dysfunction can manifest itself as an inability of a cell to produce sufficient energy to sustain itself, and has been implicated in a wide array of diseases, from infertility due to a lack of mitochondria in sperm cells, to neurodegenerative disorders such as Alzheimer’s Disease, amongst many others. Its effects can often be seen most clearly in tissues with a very high energy demand such as the retina. For instance Leber Hereditary Optic Neuropathy (LHON) is characterized by mutations affecting the mitochondrial genome, in particular genes coding for subunits of Complex I of the electron transport chain. These observations have prompted interest in exploring innovative therapeutics to modulate mitochondrial dysfunction in disorders including LHON. The Farrar laboratory has explored candidate gene therapies for complex I deficiency using for example, Ndi1, a single subunit yeast gene which is a complex I homologue. In order to test the efficacy of such candidate therapies, we have developed a robust, empirical assay of mitochondrial function. 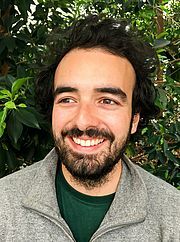 The assay is based on the work of Angelini et al. 2012 with some refinements to allow measurement of specific activity levels for complex I and homologous therapeutics. In this assay, mitochondria are extracted from cultured cells transfected with the therapy to be examined. 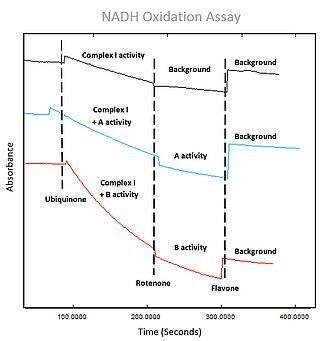 Previous assays measured the level of NADH oxidation in a sample, both before and after rotenone as a measure of complex I activity. To optimally distinguish between the activity of complex I and any potential therapeutic, the assay was modified with the addition of a second inhibitor which allowed specific measurement of the activity level of the therapeutic. A representative trace of potential therapeutics A and B can be seen in figure 1, along with the addition of the different activators and inhibitors. Figure 2 shows the rate of NADH oxidation in a number of samples, from complex I activity alone and in conjunction with potential therapeutics A and B. It is apparent that there is potential for large increases in the rate of NADH oxidation over just complex I activity alone, and that complex I and some candidate therapeutics can work synergistically. As this is an in vitro assay, it allows large-scale screening of potential therapeutics and ensures only those demonstrating strong evidence of efficacy are then tested in vivo. In combination with other quantitative assays such as Reactive Oxygen Species (ROS) generation, and indeed expansion to incorporate complex I + III activity, this enables a detailed evaluation of the health of mitochondria within a sample and thereby demonstrate the potential benefit of a therapeutic modality. The mitochondrial proteome is a vastly complicated system with current estimates at over 1500 unique proteins present in mammalian mitochondria (Nunnari & Suomalainen 2012). Anomalies in any number of these can cause mitochondrial dysfunction and as such it can be impractical or even unfeasible to design specific therapies to remedy individual mitochondrial genetic disorders. However, despite the diversity in the origin of the dysfunction, there are often commonalities in the pathology of the disease. For instance a number of disorders result in the production of reactive oxygen species (ROS) through interference of the electron transport chain or proteins related to it. All cells naturally produce ROS but if left unchecked a build up can occur which can cause unwanted oxidation of cellular proteins and eventually even cell death. High levels of ROS production and subsequent cell death has been implicated in a number of degenerative retinal diseases such as Age-Related Macular Degeneration (AMD) and LHON, and as such, ROS production represents an attractive target for a potential therapeutic (Jarret & Boulton, 2012). Currently I am investigating the possibility of modulating ROS production by suppression of targets involved in ROS generation or overexpression of endogenous proteins that aid in eliminating ROS. It is hoped that modulating the levels of such targets will increase the capability of the cell to scavenge ROS and hence mitigate the toxicity of ROS build up.